To conduct a meta-analysis to compare the clinical and radiological outcomes in single-level anterior cervical discectomy and fusion (ACDF) surgery for degenerative cervical disease performed by either single-level locking stand-alone cage (LSC) or anterior plate construct (APC). We performed a comprehensive database search of Medline, PubMed, EMBASE and Cochrane Database of Systematic Reviews according to PRISMA guidelines and identified six articles that satisfied our inclusion criteria. We excluded all non-English language articles and articles which did not directly compare LSC and APC. Only papers which focussed on single-level ACDF were included in the study. 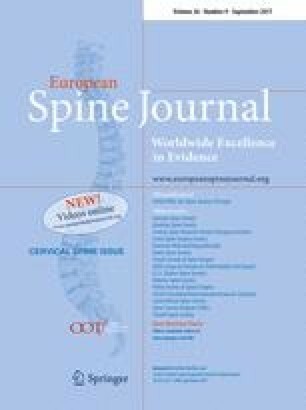 There were no significant differences in blood loss, clinical outcomes (JOA, VAS, NDI scores) or radiological outcomes (cervical lordosis, segmental Cobb angle, subsidence and fusion) between the two groups. Operative time was significantly shorter in the LSC group (MD 7.2 min, 95% CI 0.3–14.1, p = 0.04). APC was associated with a statistically significant increase in dysphagia in the follow-up period (OR 6.2, 95% CI 1.0–36.6, p = 0.05). LSC and APC have similar clinical and radiological outcomes. Further blinded randomised trials are required to establish conclusive evidence in favour of LSC with regards to minimising post-operative dysphagia. We also encourage future studies to make use of formalised dysphagia outcome measures in reporting complications.